David Arnold and Michael Price talk about composing for "Sherlock"
It's no mystery that the BBC's TV series Sherlock, which debuted in 2010, is one of the biggest cultural phenoms in recent memory — brilliantly honoring the history and lineage of Arthur Conan Doyle's classic characters while evolving to fit a new era. A key ingredient is the music, setting the series's brisk pace and bridging story elements old and new. I spoke with composers David Arnold and Michael Price, gaining insight into how they came upon the show and crafted such a unique soundscape. Additionally, we took the opportunity to ask some of you — the fans — what you wanted to know about the show's music. Read on for rich, and often comedic, insight into the craft behind a truly revolutionary creation. Garrett Tiedemann: Can you take us back to when this show first started to become a reality? How did you both get attached and what were some initial thoughts you had going in? How have your perspectives changed from then to now? Michael Price: The initial call was from Mark Gatiss to David; [they] are old friends. They were looking for a fresh take on the music, and as David and I had worked together for what seems like a couple of hundred years or so, he asked to chip in. We took a run at the pilot episode in a week or so, and most of the major themes we wrote then stayed. In hindsight, that was a pretty good week. David Arnold: I was working on a movie at the time and I knew I wouldn't be able to do it on my own..so Michael kindly agreed to ride shotgun and get on board as I really loved the show and wanted to do it. Initially Mark Gatiss just wanted to know what I thought about the show, he wasn't asking me to score it...but a few days after our meeting, when I had told him I thought it was the best piece of TV I'd seen in years, he asked if I could [work on the score]. GT: Over the course of the show how have you worked out the collaboration? Are there themes specifically handled by each of you, or do you actually work together on every piece of music? MP: Although we do both have natural sympathies to particular characters or sounds, we try and be as open as possible to each other's ideas and thoughts, as it's very much more about the show than one composer's ego. Whenever people try and guess which bits our favorites are, they mostly get it wrong. DA: the plan was to make it sound like it was a singular voice. Themes may be originated with one or the other of us, but they wouldn't be what they become without the other chiming in and suggesting different things that could happen. It's a proper collaboration. GT: How do you collaborate with the rest of the show's team? Are you involved with the decisions for use of sound, as opposed to music? MP: The sound crew, which over-achieves on a tight timescale and budget year after year, have become familiar friends, so there is a two-way exchange of demos and ideas. But ultimately they do their thing and we do ours. And then they turn their stuff up. DA: We have a great little music team who correspond with their great little sound team. We are all in the same boat so understand each other's problems...professionally. GT: Do you know the entire series when you start working on the music, or do you work one episode at a time? How does that impact the work? MP: We often do the episodes out of order, for production reasons, i.e. who hasn't finished their script yet. This can be a bit disorientating, but for season three, we did have the last episode last, which meant the big character reveal came as a surprise to us too. That definitely helped. DA: The [episodes] are generally stand-alone stories with a connective tissue of the longer story arc running through. We try to do something different with each episode...either sound-wise or thematically. We try to balance new stuff with older stuff so the world always stays the same at its core. GT: The first episode of the new season begins with quite a different feel, very hyper-real and in some ways disconnected from the musical narrative woven in the previous series, but then you start to bring in recognizable pieces a bit and unite it with the narrative you've woven over the course of the show. Can you talk about creating this piece? How did you balance what was an immediate disruption in what we've come to know as the sound of Sherlock, but also evolves it to such a wondrous degree? Were you looking to redefine everything from the beginning? MP: Yes, that was entirely deliberate, as the whole opening was a red herring, leading to Lestrade's pithy first line. We were trying to really convince people that the show had disappeared up its own self-importance. DA: The idea with that opening cue was to get everyone so incensed about how un-"Sherlocky" it was that they may have put their collective boot through the TV. The more annoyed you are that the show may have sold you out, the more satisfying it is when the bubble bursts with Lestrade's interruption. It was a total misdirection. GT: Did the time between seasons two and three provide valuable distance to re-approach the show from new angles, or were many of the choices driven by narratives decisions requiring support? You've taken a huge leap with these new compositions and I'd like to know what led to that. MP: It's definitely true that we're both a couple of years further on, as is everyone involved with the characters, and that might make us respond in different ways to the show. Ultimately, though, you have an instinctive reaction to the images on screen and do your best in the moment to respond to them. It's an intuitive thing, mostly. DA: I think we both want to move it on every time. If the show stands still then the music does too and it all grinds to a halt...so we are always trying to find something new to do with it. GT: The track Stag Night is a stunning piece and a standout (at least for me) within this great body of work for the show — a bit reminiscent of Angelo Balamenti's David Lynch projects, with a flair of Tom Waits arrangement. Where did this come from? Very dissimilar to the world of Sherlock as you two have drawn, but also completely in line with it. MP: We have a lot of experience of being drunk. DA: If we scored the whole show as drunk as the boys were in that scene...it'd all probably sound like that. I don't know what "drunk music" is but maybe this was it. Millie, commenter on Classical Notes blog: I loved the music from Sherlock right from the first episode, A Study in Pink. The final scene, with Sherlock and John walking in slow motion toward the camera as the music swelled, was absolutely perfect! I immediately made that music my ringtone, so I can hear it all the time. I read somewhere that the characters of Sherlock and John are given their own music — strings for Sherlock and piano for John. And Irene Adler has her own music. Now that I'm aware of it, I notice it more. Do you do this with the other characters, too? And how do you decide when to use the same familiar (and wonderful) music in a scene, and when to write something new? Thanks for bringing us so much listening pleasure! MP: We do have character themes — the Watson chords, Sherlock's hero theme, and the main title theme, for instance — and in fact there are lots of sub themes this time around, for Major Sholto, Magnussen, and of course Moriarty. Sometimes they're melodic or harmonic, sometimes more textural. I think it adds a satisfying layer of unity in the show, so long as it doesn't become too clever for its own good. DA: I think characters get a theme if they earn them in the story...if they are important enough to define a part of the show musically as apart from anything else. We don't have a Mrs. Hudson theme, for instance, as she's not really on her own and we are rarely within her thoughts. She belongs to Sherlock and John's world, and we have music for that. She may have a storyline in the future that requires us to come up with something for her, but as those scripts don't exist yet...we will wait and see. @tptRewire via Twitter: Is there a certain kind of music that captures focused madness? Pierce Huxtable via e-mail: Much of the show takes place at a breakneck pace (thanks in large part to the writing and lightning-fast deliveries). How do you reinforce or juxtapose this pacing with your composing? How much of an influence was Hans Zimmer's score from the Sherlock Holmes movie? There seem to be some similar Eastern European elements sprinkled throughout both soundtracks. MP: Sometimes you can lead the action, sometimes step back from it, musically, but the best results usually come from just responding honestly to it. And in Sherlock's world that often means fast. DA: The pacing of the music is a reaction to the pacing of the show. A lot of the pace comes from figures initially devised to reflect Sherlock's thought processes...they return to the show quite a lot. Regarding the film...I suppose it's not unusual to have a violin-led approach to the character of Sherlock. It's not unusual for composers to come up with a similar approach to a character, and he was a high-functioning drug user, so there's a bit of madness involved. 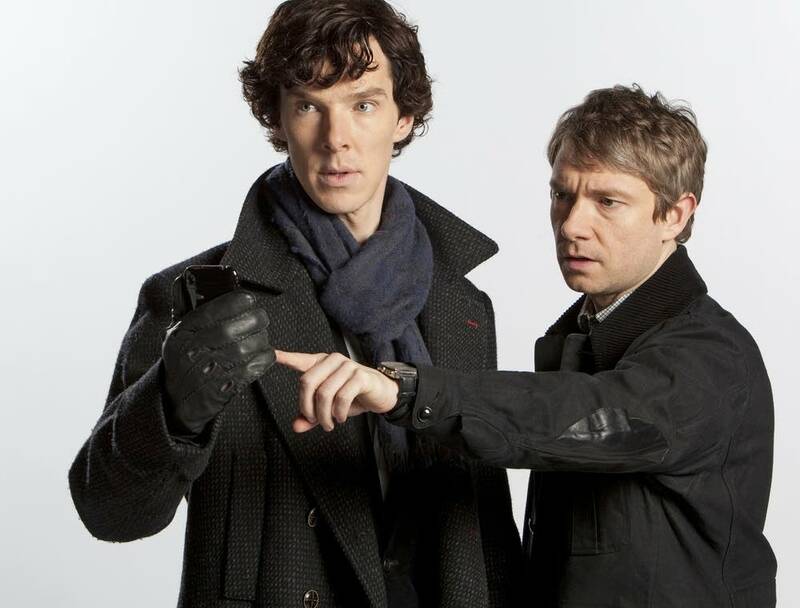 When we were working on the music for and after the pilot, the Sherlock Holmes film hadn't come out, so it was just one of those things. Pierce Huxtable via e-mail: How does your time as a dancer affect your musical choices? DA: [joking] My time at the Bolshoi was a joy but I couldn't get into the tutu by the time I hit 40. MP: I was musical director of a few contemporary dance companies in my 20s, although my own dance contribution was limited to sitting in the corner at the piano, looking uncomfortable. I can't get into the tutu either, mostly because David won't let me have it back. Pierce Huxtable via e-mail: What size ensemble usually contributes to Sherlock? DA: We have generally around 12 strings....in [the third season] we had a few more and a couple of french horns. Boats were pushed out. Pierce Huxtable via e-mail: The bold use of third-person and first-person narrative/omniscient camera styles have come to define Sherlock's shooting style. Do you try to alter your stylistic choices when the camera is shooting from outside versus inside Sherlock's mind? DA: We do. The busy-ness of Sherlock's thought process drives the style of music...when we are outside Sherlock's mind then the music becomes story telling, atmosphere setting, emotionally hand-holding music. Inside, it all gets frantic. MP: "Dear God, what must it be like in your funny little brains? It must be so boring." Garrett Tiedemann is a writer, filmmaker and composer who owns the multimedia lab CyNar Pictures and its record label American Residue Records. Interested in writing about classical music for Classical MPR? Have a story about classical music to share? We want to hear from you!